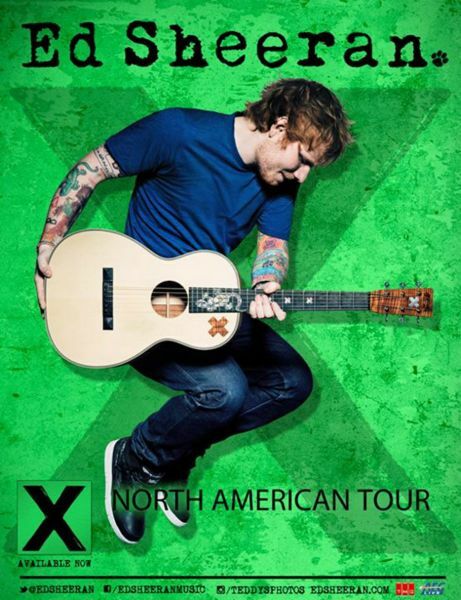 Due to popular demand, the Grammy Nominated Singer-Songwriter has added a second leg of his North American Tour GRAMMY Nominated Ed Sheeran to perform at Verizon Center on September 22 and 23, 2015 Tickets Go On Sale Friday, April 10 at 10 a.m.
Monday, April 6 at 10 a.m. through Thursday, April 9 at 10 p.m.
Atlantic recording artist Ed Sheeran has announced a second leg to his North American tour, kicking off at BBVA Compass Stadium in Houston, TX, on September 3. Promoted by AEG Live and The Messina Group (TMG), the month-long trek includes some of the GRAMMY-nominated singer-songwriter’s biggest headlining shows in North America to date (see attached itinerary). Pre-sale tickets will be available for select dates starting on April 6, followed by general public on sale tickets starting on April 10. For more ticket information and tour updates, please visit www.edsheeran.com. Sheeran is still riding high with the chart-topping success of his current single “Thinking Out Loud.” Already one of the biggest songs of 2015, “Thinking Out Loud” has earned Sheeran the highest charting of his career at multiple formats, going to No. 1 at Top 40, Hot AC and Adult radio, as well as holding the No. 2 spot on the Billboard Hot 100 for a staggering eight consecutive weeks. “Thinking Out Loud” has also enjoyed global success, having gone to No. 1 in nine countries around the world, including his native United Kingdom, while the beautifully-shot companion music video (http://youtu.be/lp-EO5I60KA) – directed by longtime collaborator Emil Nava – has already amassed over 368 million views worldwide. “Thinking Out Loud” is the third single from Sheeran’s RIAA-certified platinum album x (pronounced multiply), which recently won Best British Album at the 2015 BRIT Awards and was nominated for Album Of The Year at the 57th Annual GRAMMY Awards. Recently, Sheeran unveiled the companion music video for the song “Bloodstream” (https://youtu.be/Orq_75kFi8I) – a collaboration with fellow BRIT Award winner and Atlantic label mate Rudimental, who are currently finishing their second studio album. The cinematic video – directed by Nava and starring acclaimed actor Ray Liotta – was filmed exclusively for this year’s YouTube Music Awards (in association with Vice), which celebrates acts with the biggest growth in views, subscriptions and/or interactions with fans over the last six months. Sheeran recently performed the original version of “Bloodstream” – which appears on his album x – at the 2015 BRIT Awards. For additional news and information, please see www.edsheeran.com, www.twitter.com/EdSheeran(@EdSheeran), www.facebook.com/EdSheeranMusic and www.atlanticrecords.com. Check out #EdOnTour2015 to see what fans are saying about the upcoming tour.